While working on an article or blog post, it can be challenging to find just the right multimedia content to pair with your text. You may not always have the time or means to produce video, or it may not be the best option for the content. Or, perhaps, you don’t have any photographs and aren’t sure you want to use stock photos. In any of these cases, creating an infographic to showcase your data can be a real asset in telling your story. 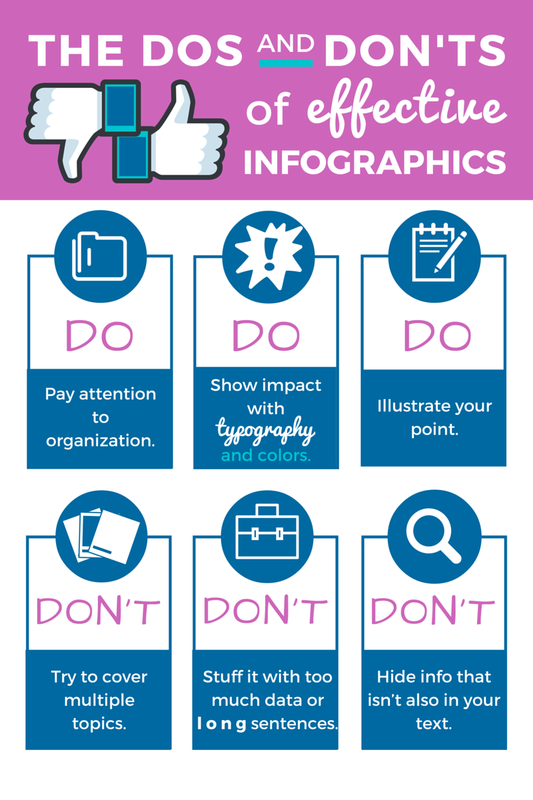 Once you’re convinced that an infographic is just what you need, there are a few dos and don’ts to have viewers reading and sharing your new content in no time. Don’t try to cover multiple topics. Your article really is the place to expand upon ideas. The infographic is your chance to both summarize – and tease the audience – about the content it’s accompanying. A narrow focus helps you to be able to get a quick set of facts on a single topic to your audience through a visual means. Narrow your topic to one theme or set of data if at all possible. If those looking at it can know immediately your point, you have succeeded. Don’t stuff your infographic with too much data or long sentences. Don’t stuff your infographic full of so many facts that people don’t even begin to read it. It’s common to see long, skinny infographics that continue to share data down the page. While this can be effective if you have a lot of data that is imperative to share, it’s best to have an infographic that is a single section of information. If you need to make a long, skinny infographic for your content, make sure that it can be broken into bite-sized pieces that can be shared separately from one another. It’s OK to have more than one infographic! Don’t hide information in an infographic that isn’t also in your text. This tip is particularly important if you’re using your infographic in conjunction with important financial, legal, or regulatory news. Don’t bury facts in just an infographic and never cover it in your article. You want this infographic to help with your credibility and establish you as a creative resource. This is a chance to highlight your most important points in an engaging, visual way – use it! Organizing your content in a way that makes sense to those looking at it can be as important – if not even more important – than the news itself. Spend some time planning out what you want to say and organize it in a way that is immediately apparent upon first glance. If the reader has to spend time trying to figure out the flow of the infographic or keep track of the message, part of their retention for your actual information will be lost. It is worth the time to use section headers, lines, color changes, and shading to help you organize effectively. Show impact with typography and colors. Typography can be a powerful tool to help you express your message. If you want to inspire someone to take action, perhaps you can use a bold or more daring font. If you have a more elegant and refined message, perhaps you want to use a scripted font. If a font change can help you with the intention of your infographic, consider a font change. Color is equally important. Color isn’t only branding or paying attention to psychological assessment of which colors are most effective in messaging. Use color to draw attention to important words or phrases, to organize your content, or to correlate to the symbology of your message. If you have an urgent warning, you probably don’t want that to be yellow text on a white background, for example. An infographic is a unique opportunity to use symbols and iconography to work as a subliminal message to the viewer. Much like the arrow in the FedEx logo, a good icon or symbol can be as effective as many words. You don’t need to TELL a reader about a heat index, for example, if you can work in a thermometer with your infographic. With just a little planning of good, simple imagery, you can add much more to your message in a short amount of time than paragraphs of text can accomplish for you. Are you a journalist, blogger or content creator that’s looking for multimedia? Sign up for PRNJ today to gain access to thousands of downloadable photos, video, audio and other documents, including infographics and more. It’s easy and free. Jaimee Bruening is a manager, online services for MultiVu/PR Newswire. Find her on LinkedIn or on Twitter at @JBru14.